What do such big animals eat? The diet of manta rays differs from other fish consuming the flesh of smaller species of living beings. Manta rays are closely related to sharks and in fact are chondrichthyan, i.e. they possess an internal skeleton of cartilage, but unlike sharks, manta rays don’t eat the flesh of large animals. Surprisingly, manta rays feed thanks to the consumption of tiny organisms that together make up the plankton. This may be phytoplankton and zooplankton, but these animals eat only the zooplankton navigating at the mercy of the ocean currents. However, they are so small that manta rays need to introduce a huge amount in their bodies. Despite having teeth, these fish do not chew food. In their gills they have structures called gill rakers that work by filtering zooplankton, preventing the entry of water and allowing the introduction of big quantities. Incidentally, only the lower jaw has teeth, the upper is devoid of them. Also they are known to be able to consume small fish, but they represent a fraction of their usual diet. In total, they consume about 12 or 13 percent of their total weight in a week. Manta ray filtering their food. And how do they get their food? Plankton tends to be concentrated in certain areas, so it is possible to find a cluster in a large volume of water from a specific area. A hungry manta ray swims through the ocean in search of concentrations of zooplankton, but usually several manta rays gather around coral reefs to get food and be cleaned by fish and small organisms. During their time swimming they keep their cephalic lobes coiled, those structures like “horns” they have at the top of the head, but when it comes to eating they stretch them forming a tunnel to help boost food-rich water. Usually they feed near the water surface, where the plankton is floating. Often large groups have been sighted of up to 50 manta rays feeding side by side while swimming vigorously, as if they were in a real submarine feast. During this activity it is common for them to rotate repeatedly under water and to open their mouth with the body in a horizontal position. It can be amazing to see how their jaws open, noting that a fish of medium size would easily fit in their mouth. Along with the plankton they also swallow fish larvae and other small organisms. Once swallowed, the food passes through the gill rakers to be filtered and utilized in the digestive system of the manta ray. The movements carried out in water are related to energy saving. Sometimes they can rotate from left to right or right to left with an open mouth, sometimes simply swim vertically with the head slightly tilted upward. Tumbling is effective when the plankton is densely concentrated, so they swim through it. Other times they form chains of 100 manta rays swimming one behind another. This has only managed observed in the Maldives, but it is all a visual delight. 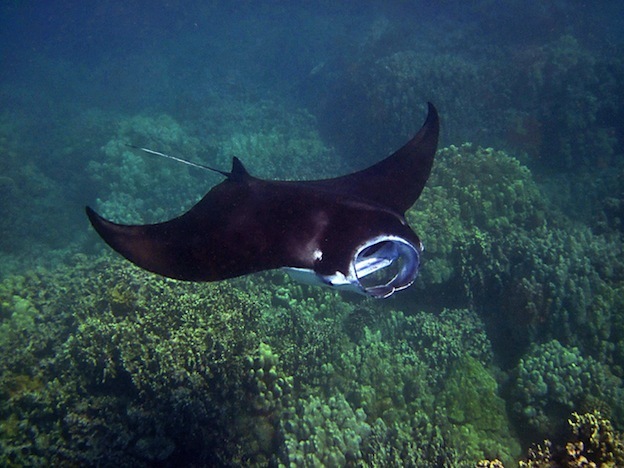 If the plankton were near the seabed, manta rays have to approach until placing the bottom of their body a few centimeters above the ocean floor, which often causes them minor injuries due to eventual contact with abrasive grains of sand. It must be said that most manta rays that have been observed feeding have been reef manta (Manta alfredi) because their coastal habitat makes them relatively easy to look targets, which does not happen with giant manta rays (Manta birostris). However, the eating habits of both species can be basically similar.